For years, those who wanted to earn frequent flyer points towards discounted trips on Delta Air Lines or United Airlines could do so without flying using a credit card with a moderate annual fee. Now, both airlines are offering travelers the opportunity to earn towards their next trip, without having to pay extra for the benefit. In September 2017, both airlines launched new products alongside their respective bank partners. Delta launched the Blue Delta SkyMiles Credit Card from American Express, while United launched the Chase United TravelBank Visa Signature. While both cards offer the opportunity to gain value towards their next trip, both offer them in completely different ways and with different benefits. 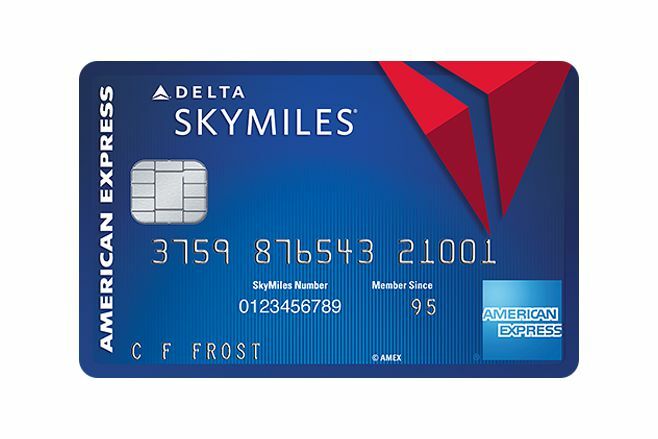 The Blue Delta SkyMiles Credit Card from American Express is the first Delta-branded credit card to launch without an annual fee. Those who are approved for this card can earn two Delta SkyMiles points per dollar on all purchases made with the airline, along with those at U.S. restaurants. All other purchases earn one SkyMiles point per dollar spent. Cardholders also get a number of valuable benefits with the card. Those flying aboard Delta can get a 20 percent discount on in-flight Delta purchases, including food and beverage. The discount comes in the form of a statement credit. While the card offers valuable benefits, it comes short of the next card in the portfolio, the Gold Delta SkyMiles Credit Card from American Express. The Blue Delta SkyMiles Credit Card does not come with one free checked bag waiver, priority boarding on flights, or discounted Delta Sky Club day passes. Unlike other points bearing cards, the Chase United TravelBank Visa Signature card offers a new way to earn travel awards with no annual fee. Instead of earning United MileagePlus miles, spending on this card yields cash back applied to United frequent flyer cash bank, TravelBank. Spending on the Chase United TravelBank Visa signature earns 1.5 percent cash back on all non-United purchases. When using the card to purchase United airfare, the card returns two percent cash back towards the United TravelBank. In addition, travelers receive a 25 percent rebate on food and beverage purchases while aboard United-branded aircraft, in the form of a statement credit. Unlike most points programs which require travelers to use all of their points towards a trip, flyers electing to save cash in a United TravelBank can apply any amount of their balance towards qualifying airfare. For example: if a flight costs $500 and travelers only have $250 in their TravelBank, they can apply that balance and discount their flight. Much like the Blue Delta SkyMiles Card from American Express, the card also comes with some limitations as well. The Chase United TravelBank Visa Signature card does not offer a free checked bag waiver or priority boarding, nor does it offer a rebate on wi-fi purchases made with United. As with all points and miles, your value may vary based on your travel style and location. Travelers who have limited choices in carriers at their home airport may want to select the card for the predominant airline to maximize value. Those who have a choice need to determine how they use their credit cards in order to determine which holds a better value. When pairing the Blue Delta SkyMiles Credit Card with other programs, including SkyMiles Dining, the card can hold long-term value when used at U.S. restaurants. However, those who would rather have a steady amount of money available to them to travel over time may fare better from receiving cash back using the Chase United TravelBank Visa Signature. Finally, before applying for either card, travelers should consider their immediate travel plans. The Blue Delta SkyMiles Credit Card allows travelers to earn points quickly, but with constant devaluation and a dynamic award chart, those points could hold more value when being used sooner rather than later. While the value of points can vary over time, cash collected in TravelBank holds value against airfare – allowing travelers to retain value in the long-run. Those who do not have immediate travel plans may benefit more from the United TravelBank Visa Signature. No matter your travel style, the addition of two no-annual-fee rewards cards offers great value to flyers. Regardless of which card you choose, both the Blue Delta SkyMiles Credit Card and the United TravelBank Visa Signature could be a valuable addition to wallets everywhere.